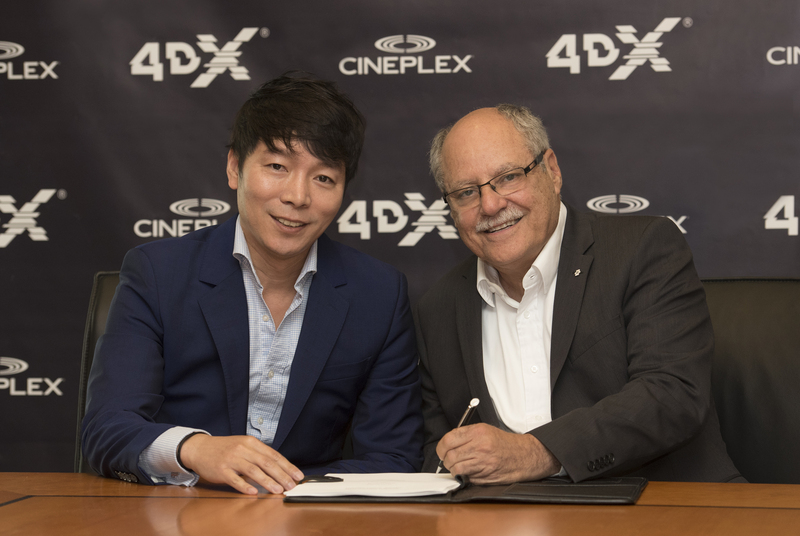 LOS ANGELES & TORONTO (September 20, 2018) – Today CJ 4DPLEX, the world’s leading cinema technology company, in partnership with Cineplex, a leading entertainment and media company, together announced a new agreement that will bring the 4DX experience to as many as 13 additional Cineplex locations across Canada over the coming years. The companies opened Canada’s first 4D auditorium at Cineplex Cinemas Yonge-Dundas and VIP in the heart of downtown Toronto, Ontario, in 2016, and its popularity with guests has prompted this new partnership and investment. CJ 4DPLEX’s 4D technology enhances the onscreen visuals of action-packed blockbusters, transcending the traditional cinema experience through special effects including motion-synchronized seats, wind, fog, rain, lightning, snow, bubble, vibration, and scents. The result is one of the most immersive cinema format in the industry, drawing fans into the action on the big screen. The opening of the 4DX auditorium at Cineplex Cinemas Yonge-Dundas and VIP marked the 300th screen for the premium format. Since the launch of CJ 4DPLEX in 2009, the immersive theatre technology rapidly expanded around the globe averaging 100 screen openings a year at an average yearly growth rate of 70 percent. To date, 4DX is installed in 561 auditoriums, reaching 59 countries, and projected to reach 630 auditoriums by the end of the year. While Cineplex and CJ 4DPLEX announced today that Calgary would be the next Canadian city to open a 4DX auditorium, the companies will work together to announce additional markets over the coming months. CJ 4DPLEX is the world’s first 4D cinema company, headquartered in Seoul with international offices in Los Angeles and Beijing. The company created 4DX, the first and leading 4D cinema technology for feature films, providing moviegoers with an immersive cinematic experience that utilizes all five senses, allowing the audience to connect with movies through motion, vibration, water, wind, snow, lightning, scents, and other special effects that enhance the visuals on-screen. CJ 4DPLEX brings 4DX auditoriums to exhibition partners along with 4DX codes for both major Hollywood blockbusters and local titles. Each auditorium incorporates motion-based seating synchronized with more than 20 different effects and optimized by a team of skilled editors, maximizing the feeling of immersion within the movie, beyond the limits of audio and video. Since 2009, more than 550 Hollywood and local titles have been screened in 4DX. As of September 2018, more than 65,000 4DX seats operate in 552 auditoriums spanning 59 countries.